Across The Universe es one of the series I've enjoyed more, maybe because I wasn't expecting to enjoy science fiction so much. Shades of Earth is the conclusion of Amy and Elder's story, when they finally leave Godspeed, a home and a jail. I tried to read this book last year, but I don't know why I couldn't read it, even when I was very curious. So I left it on my bookshelf for months until a couple of days ago I decided to give it a second chance and wow! I stayed up until 1 am to finish it. It kind of felt too short for an ending. There were so many different things in this new and unknown planet called Centauri-Earth. Besides, it wasn't really easy to decide to go to a new world and leave Godspeed behind, the place that has been a home for many years to must of them, to a planet where there are monsters and the Frozens and Shipborns will have to share everything without forgetting about Orion's warning about soldiers and slaves. The story is a mix of secrets, problems and discoveries that made me ate the whole book in a couple of hours. I simply couldn't stop reading, I love how the author wrote about the social issues between this new colony and how it affected them to survive in Centauri-Earth. Also, I admit it, I was very curious when it started to be obvious they weren't alone in this planet... they were supposed to be the firsts one here. But they have been orbiting in Godspeed more years than what was planned so it wasn't an idea so crazy. Are they aliens? Monsters? I started to suspect the truth very early in the book, and although I was right, the story threw me a lot of plot twists that surprised me a lot. I wasn't expecting that ending at all! That is the main reason I loved the Across The Universe saga. 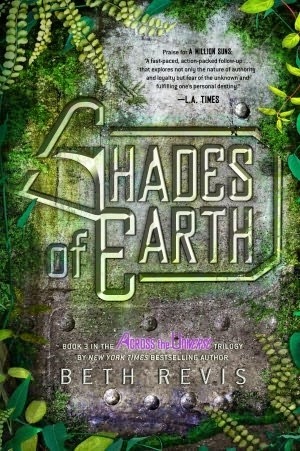 I think Science Fiction is a genre that hasn't been very explored in YA books, but Beth Revis wrote a very interesting story, full of plot twists that always surprised me (which hasn't been easy lately) and where she writes about many social issues that we live daily in our reality and always change the story. It has the right amount of romance to not make it only a romance story, and although Shades of Earth has some kissing scenes that I believe where out of place sometimes (and a maybe-love-triangle that I'm very happy it didn't work), I think it's a very good and surprising ending, but too short. It could have been a little bit longer, specially the last chapters, I simply wanted more details. I wanted more!. It all ended too fast and sometimes seemed like unrealistic because there might be safe now, but still have a lot to face in this new world! More about this book at Goodreads, Amazon US, The Book Depository. This book looks so good! I really want to read it. Great review! Hope you read it soon!